A unique and individual development of two traditional stone built villas located in the heart of Pachna village (Limasol District) close to all amenities. The village is surrounded by vineyards and is in the heart of the Cypriot wine making region. It has many wineries in the immediate vicinity. 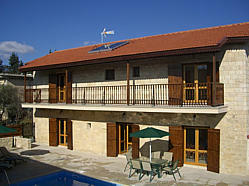 The Villas have been finished to a very high and traditional standard. 3 bed two bathrooms with multi jet showers and downstairs cloakroom, fully fitted wardrobes in all bedrooms, fully fitted solid oak kitchen with all appliances, A/C in all rooms and gas fired central heating, Heated swimming pool 8m x 4m. 32” flat screen TV and DVD player. 4 bed three bathrooms with multi jet showers, Jacuzzi and downstairs cloakroom, fully fitted wardrobes in all bedrooms, fully fitted solid oak kitchen with all appliances, A/C in all rooms and gas fired central heating, Heated swimming pool 8m x 4m. 32” flat screen TV and DVD player. 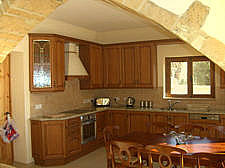 A restored traditional stone arch separates the kitchen area from the living room. Open plan living room, dining room and fully fitted solid oak kitchen with all modern facilities. Luxuriously furnished for comfort and with respect to the house history and location. The living and dining areas offer ample comfortable seating, a 37" flat screen plasma tv, CD and DVD players. All spaces open through sets of double doors out onto the same level pool terrace, thus adding to the living area and creating an easy natural flow incorporating the indoor and outdoor areas for a relaxed vacation living style. 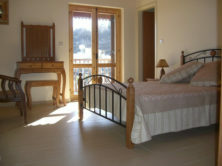 The ground floor also includes a double bedroom and guest cloakroom. The villa if fully air conditioned and also offers full gas fired central heating throughout (both services at an optional extra cost). You will need the central heating October to April inclusive and possibly May and you will need the air-con July and August. Master bedroom with king size bed and ensuite shower room (jet shower). A further bedroom with twin beds and shares the luxury family bathroom with bath and separate walk in mullti jet shower. Villa Atlantia has another double bedroom on this floor. The upstairs bedrooms have access to the long feature wooden balcony from where you will enjoy the views of the village and the countryside, having a leisurely drink, whilst everybody is getting ready for the evening stroll to one of the nearby famous restaurants. Large enclosed private stone courtyard with swimming pool and views of the village on the hillside.Plenty of space to soak up the sun in privacy. 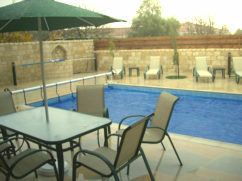 The swimming pool us a salt water pool the ideal natural way to keep the pool clean without using chlorine. The salinity levels are much lower than sea water that prevents less eye and skin irritations and also is less damaging to swimming suits. Driving distances from Pachna to places of interest and attractions.